(Host) Rising fuel prices are prompting more people to ride Vermont’s small, rural transit systems to work, stores or medical appointments. The business is welcome, but the agencies that operate the routes say the higher prices are also driving holes through their budgets. (Albright) It’s a gray but mild morning as regular riders of a small red bus operated by Rural Community Transportation based in St. Johnsbury climb aboard and greet each other. Charlotte Piadade and Beverly Withers live in the same affordable housing project and always sit together. (Piadade) "We ride all day and sometimes we don’t get off and sometimes we just get off somewhere and go to the bank, somewhere like that. We are going to stop at the grocery store today." (Withers) "Then we have community lunch we go to Monday, Wednesday and Friday"
(Albright) Others on the bus are going to work or school. 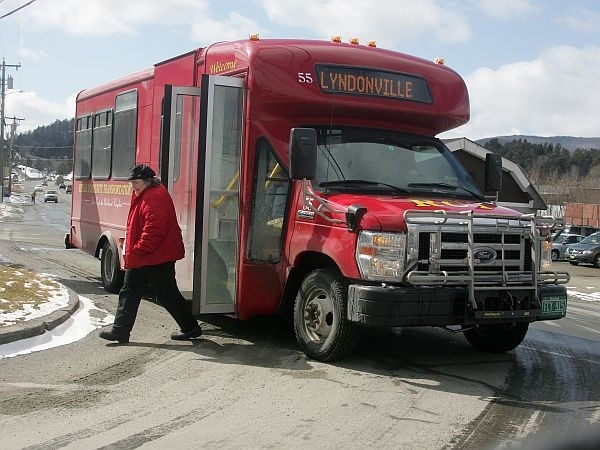 A new RCT route launched at the end of January from St. Johnsbury to Montpelier was instantly so popular that a bigger bus had to be scheduled. Farther south, in the more congested Upper Valley, it’s a similar story. Advance Transit saw a 15 percent increase in ridership this February, compared to last February. (Chesnut) "I’m not even sure it’s the actual price per se but the rapid rate of increase has really shocked people into changing their behavior." (Albright) That’s Van Chesnut, Advance Transit’s Executive Director. He says ridership and routes have been steadily increasing on the system’s buses since 1998-so much so that a recent study by the regional planning commission found a striking improvement in air quality that can be traced to the decrease of cars on the road. (Chesnut) "All told there were over a million miles of automobile travel saved each year, I believe over fifteen tons of carbon monoxide, and some other positive trends being reported." (Albright) Though fare structures and revenues vary across the state’s thirteen community run transit systems, they all depend heavily on federal, state, and local subsidies. Some large employers also help foot the bills, and save on parking spaces. Fares-which can be free–account for a tiny fraction of revenues. And when gas prices spike, subsidies and corporate sponsorships don’t always keep pace. Still, Chesnut says, Advance Transit’s buses have to fuel up and go, regardless of the price. (Chesnut) "Oh, I think we put on about 600,000 miles a year." (Albright) If gas prices stay high, he says Advance Transit is studying the impact of charging for travel. But it’s not a simple equation because some riders might go back to their cars, and civic-minded sponsors might also bail out. Whatever Vermont’s small transit systems do to balance their budgets, the director of UVM’s Rural Studies Center predicts they are likely to find workable solutions. Jane Kolodinsky thinks Vermont’s non-profit community carriers are an invaluable resource. (Kolodinsky) "And sometimes those smaller micro-buses are a less expensive alternative than would be a large centralized transportation system." (Albright) Maybe. But in St Johnsbury, RCT’s Operations Manager David Towle has appealed to the state for emergency assistance to cover higher gasoline bills. He’s not at all sure he’ll get help since the state budget is so tight. But he wants to avoid cutting back routes, because so many in this isolated area depend on them.